Kingdom Vapor is a high-quality wholesale e cigarette distributor that provides our customers with the best vape juices in the industry. We are known for selling vapor juice wholesale to vape and tobacco shops around the country since 2012. We always make sure that our customers are fully satisfied so we will stay connected to you after your purchase. We also do not require a minimum purchase quantity, so that you can make the best decisions for you and your company to find the best products for the best price. Kingdom Vapor is designed to help you open up your own vape shop if you want, or just be the reliable and high-quality supplier you need. We have your back for all things electronic cigarette. We sell a wide selection of different vapor juice wholesale which means you can carefully select the option that is best for you. We have 100ML e-liquid, 60 ML e-liquid, and Nic Salt e-liquid, and each comes with a wide array of flavors. We also have kits, mods, tanks, coils, and accessories to match. Our e-liquids are made up of propylene glycol (PG), Vegetable glycerin (VG), nicotine, and flavoring agents, which makes them safe, efficient, and taste good. PG is commonly used in industrial air filtration systems to reduce bacteria, and VG is usually used in fog machines, which is why our vape liquids produce thick, white clouds. Luckily, not all of our e-liquids contain nicotine, so if you have customers that prefer no nicotine, you can have options for them too. Our flavoring agents are the same ingredients found in candy, soda, or gum, so it tastes like the real deal. 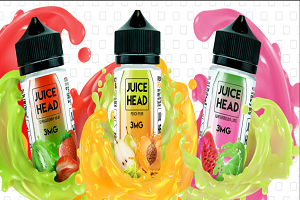 Our vapor juice wholesale is always made in a clean and highly supervised facility and are well trusted with brands like Keep it 100, Stix, Lemon Twist, and Sad Boy. Our best-selling 100ML e-liquid is by Keep It 100. Keep It 100 e-liquids come in twelve different flavors, such as Blue Slushie Lemonade, Strawberry Milk, Mallow Man sugar cookie flavor, and including a limited-edition Apple Cider Donut. Delight your customers with something different, yet tasty with Ferrum City’s Cereal Monster line. Try Blooberry, Choculate, Scary Berry, or Lucked Up as a different way to vape. It’s like your childhood breakfast nostalgia, but in a vape on the go wherever and whenever you want it. 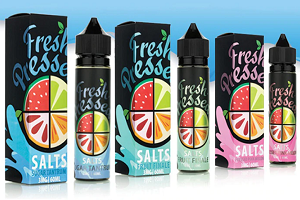 Our best-selling Nic Salt e-liquid is Pod Drops in 30ML bottles. 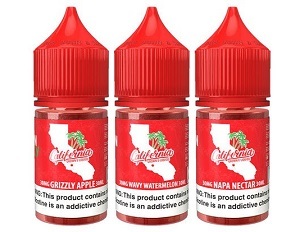 The flavors range from Fruit Cup, Fruit Freeze, Katy Peary, Mad Mint, and Vanilla Tobacco, so you can have a wide array of flavors ready to sell that will please all different palates. Pair these Nic Salts with a SMOK Infinix pod system, just fill up the empty pod with a tasty Nic Salt e-liquid and vape with ease anywhere. The Infinix is unlike other vape batteries, as it uses a draw-activated mechanism, so no button is needed during the inhale. It is a smooth and safe way to consume our nicotine e-liquids and makes it easier than ever. Order your vapor juice wholesale from Kingdom Vapor today to create happy customers with top quality juices. Operating a successful vape shop has its challenges. There is the inherent day to day bustle of sailing a tight ship regardless of chosen industry, with records, books, and sales forecasts, but then there are the intrinsic nuances of the vape market. With changing customer preferences in flavor and with new technology being constantly absorbed into the market and becoming mainstream, it can seem like there is an endless flow of new information. However, with these challenges come the incomparable satisfaction of keeping a lucrative vape business, customers sated by the fruits of the vaping experience, and competing in one of the most rewarding businesses around. To minimize the obstacles and maximize the fulfillment of running a vape shop, choose Kingdom Vapor for Joyetech wholesale. Kingdom Vapor holds a respectable and thoroughly curated selection of Joyetech merchandise, from coils to tanks to mods, all representing the most coveted products Joyetech has to offer. When you need a solution for Joyetech wholesale, the only answer can be Kingdom Vapor. Carrying the AIO, Atopack Penguin and mods as well as coils and tanks with which to accessorize and customize them, Kingdom Vapor is well prepared to furnish you with the best from Joyetech. The AIO boasts a demur profile and somewhat traditional lines, and plenty of power with a 1500mah battery and a 2 ml tank. 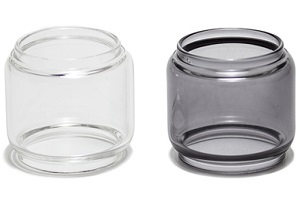 A cup within the tank helps minimize spillage and simplify filling, while at the same time offering child resistant qualities. 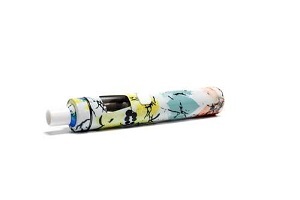 The Joyetech Atopack Penguin provides an even more powerful 2000 mah battery and a large 8.8 ml e liquid capacity for extended use. With a 50 watts of power, single button operation, and short circuit, low voltage, and low resistance protection, this pod based system offers ample conveniences for the experience minded vaper. While this is impressive enough, it doesn’t stop here. Kingdom Vapor is the choice supplier for mods, e liquids, salt nicotine, and replacement parts and accessories from the most popular brands and makers. When you need replacement coils and tanks or batteries to keep on hand for customers who are judicious about their spares Kingdom Vapor is at the ready. When you hear about the newest mods from not only Joyetech but Wismec, Vandy Vape, Coilart and more, you know where to find them. When you hear buzz about not only the popular Keep It 100, The One, and FLVR but new flavors and names on the rise, you can turn to Kingdom Vapor to keep you well informed on the trends and well stocked with the favorites. To keep you furnished with the compatible components for all the hottest mods, whether you need to keep tanks, replacement glass, coils, batteries, or other proprietary components, Kingdom Vapor has what you need. On top of it all, Kingdom Vapor’s team of professionals bring their years of experience to your service, which is why they know what’s hot and why. When you have a question about a product or a trend, Kingdom Vapor’s staff is ready to help. Moreover, when you purchase you can enjoy a complete liberation from minimum order quantities, freeing you from penalties associated with minimum order quantities to restore control of your inventory to you and your staff. Head to kingdomvapor.com today to get started. • Know Your Customers – Let’s face it, while there will be tons of people who will come into your shop and know exactly what they want, there will also be a fair number of new vapors who are going to need additional assistance with choosing vape products and devices. You should definitely know what products your loyal customers typically buy but keep your new vape customers in mind as well. At Kingdom Vapor, we offer starter kits that will be the perfect product to keep in stock at your vape shop for new vapors. • Stay Ahead of the Competition – There are tons of websites and physical vape locations that are available today to vape consumers. There are also tons of new devices, products, and vape technologies that are constantly being introduced to vapors. Keeping these factors in mind, how will you stay ahead of the competition? When you shop at Kingdom Vapor, you stay ahead of the competition because we offer the latest products from the most-trusted vape brands like customer favorites such as Aspire, Vivant, Suorin, and more. • Vape Variety – E-liquids are probably the most important vape product at the moment. Vapors are constantly purchasing new e-liquids to use with their device, trying out various types of e-liquids with many different flavors. Even though there tons of e-liquids available, most customers usually have a personal favorite e-liquid they like to use with their device. 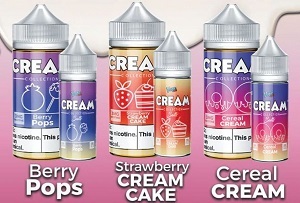 New vape users, however, might want to try some different e-liquid options once they begin vaping. 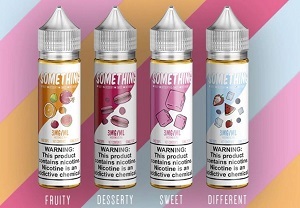 Whether your customers like e-liquids with a strong, fruity flavor or prefer stronger nicotine salt e-liquids, you should always have variety in your vape shop for any type of consumer. At Kingdom Vapor, we have different options of e-liquids available, including nic e-salts and different sizes of e-liquids. • Have a Knowledgeable Staff – Your vape shop should be the perfect spot where your customers feel comfortable to hang out and do their vape shopping with friends. Having a personable, knowledgeable staff can be a great asset to your vape shop. If your staff knows what they’re talking about and what products they’re selling, it’s much more likely that your customers will keep coming back. That’s why at Kingdom Vapor, we have an up-to-date staff of vape users and enthusiasts who are passionate to deliver you with the best knowledge and vape products in the industry. Since 2012, Kingdom Vapor has been providing wholesale vaping supply to traditional tobacco and vape shops. If you’re thinking of opening your own vape shop, let us assist you throughout the process. Contact us today at 814-297-8240 or info@kingdomvapor.com for more information. There are many choices for wholesale supplier to keep your vape shop up and running, but there is one choice for wholesale e cig supplies that will keep your shop running and thriving. When you need to stock the shelves or offer some new inventory based on the clamoring of loyal customers, turn to Kingdom Vapor. Since 2012, Kingdom Vapor has been the premier wholesale vapor supply partner for select vape shops and vape shop owners across the country. That’s because everything, from their attention to detail, to customers’ preferences and demands speaks volumes about their passion for the product itself and drives them to offer you the best wholesale e cig supplies at the best prices possible. Part of what makes Kingdom Vapor the go-to for wholesale e cig supplies is their impressive array of stock. While some suppliers specialize in one or two categories, specializing in eGo style stick batteries or basic mods or in battery cells, or even in e-liquids, Kingdom Vapor has it all. You can turn to Kingdom Vapor as your one stop shop for all your vape supplies. Kingdom Vapor has everything you or your customers need. In the way of regulated mods they carry hot brands such as Wismec, Limitless, Aspire, Smok and Vapor Storm to list just a few. These brands are desirable to customers because they offer a ton of features to the user. The convenience of variable wattage allows for more voluminous clouds of vapor. Built-in battery protection allows the user to vape higher wattages without worrying too much about battery failure. In terms of mechanical mods, Kingdom Vapor carries stock from Vandy Vape, Coilart and Cigreen to keep your mechanical fans and high-end customers happy. Searching for e-liquids? To name only a few, Kingdom Vapor carries Keep it 100, Twist E-liquids, Pacha Mama, Vape 100, Ferrum City and Sadboy. Additionally, Kingdom Vapor carries all of the tanks, batteries, coils, and other vaping essentials that will complement and perfect your supply. A gripe of many resellers is the practice of wholesalers to require minimum order quantities to guarantee that an order will ship. At Kingdom Vapor, you are entirely free of minimum order quantities – what you need is what they ship, even if you’re only in need of one or two pieces. You know your customers best, and whether you need 10 units or 1000, Kingdom Vapor stands behind you and ensure the quality of their product. Kingdom Vapor puts you, the customer, first; just the way you service your own, and that’s exactly how it should be. What pairs perfectly with Kingdom Vapor’s supply of wholesale e cig supplies is their experience in the industry. Their careful attention to their customers and the trends of the market and products therein have helped to make them the experts. When you hear customers asking about a product, just call in for one of the representatives at Kingdom Vapor. Similarly, when you see something hot and new adorning the pages at Kingdom Vapor, you can trust it will be up and coming. To get a sense of what’s new in the field, contact the team at 1-814-297-8240 or head to www.kingdomvapor.com. Their team is always ready to help. Most all of us have dreamed of opening our own business in an industry we’re passionate about. If you’re one of the few who have decided to actually pursue that dream, you’re going to need every edge you can get your hands on to beat out the competition. While vaping as a hobby is laid back and relaxing, business is still business, and that means that running a vape shop requires preparation and smart thinking. If you’re setting out to make your new vape shop a stellar success, you’re in luck; this guide will give you 3 awesome reasons to get wholesale electronic cigarettes in advance, so you can meet your customer’s needs on day one. The most straightforward and important reason to buy wholesale electronic cigarettes is simply the fact that you’ll save yourself money. Buying bulk always comes with the benefit of reduced per-unit cost, so by purchasing wholesale electronic cigs, you’ll be able to get huge amounts of product for a fraction of the price you’d usually pay. In any business, competition can be tough, and that fact is no different in the vapor industry. Cutting costs gives your company a foundational advantage that can help you save money. Saving money means re-allocating funds to the areas of your business that really need it. Buying your e-cigs on a wholesale basis means that you won’t have to waste time individually loading out online shopping carts with various models one-by-one. Buying wholesale means that you can turn your attention elsewhere; instead of having to micromanage every single order of new stock, you can ensure that you get all that you need, on time, without having to waste so much time with inefficient processes. At Kingdom Vapor, you can buy wholesale with no minimum order and low shipping costs, saving you the hassle if you want to stock your shop with specialty brands or electronic cigarettes. Buying wholesale electronic cigarettes from Kingdom Vapor also means that you can get what you need when you need it. You never have to order a minimum amount and shipping costs are low for your convenience. This way, you can keep your shop stocked with the products you want and your customers enjoy and allows you to have plenty of supply out back that you can move quickly and profitably. More than nearly any other industry, the vaping industry moves on word-of-mouth, which means that a single sale of a good product could lead to a sudden surge of interested buyers! Don’t leave them hanging; have the products you need on hand in advance. You’re not alone out there! If you want to learn more about how your vape shop can save money, stock good stuff, and stay ahead of the game, visit www.kingdomvapor.com. The team at Kingdom Vapor is professional, passionate, and ready to help your shop become the go-to shop in town. Vaping has been steadily on the rise the past few years. It seems like every day there’s a new vape product or vape shop opening in your neighborhood. Whether you’re already a vaping veteran, interested in trying vaping out for yourself, or own your own vape or tobacco shop, it can be difficult to keep up with the latest technologies and products in the vaping world. At Kingdom Vapor, we aim to not only keep our customers updated on the latest vape technologies but also satisfied with all of our products and customer service. Since 2012, we’ve been providing premium wholesale vapor products to traditional tobacco shops, vape shops, and customers. We’re passionate about vaping, which is why we fully test all of our products to before they are brought in and sold to ensure that they are quality products that fit our standards. Our team of knowledgeable sales representatives are always happy to help with any questions you might have or assist you throughout your order. We have thousands of products available, including some from the best brands in the vaping industry today. Our products include vape kits, mods, tanks, coils, e-liquids, and accessories. • Kits: Our kits include starter kits, advanced kits, and pod systems from brands like Suorin, Aspire, Joyetech, SMOK, and more. • Mods: Including regulated and mechanical mods, which will have more vapor than typical vape pens. 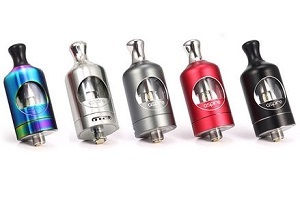 • Tanks: Our tank categories include rebuildable atomizers, wholesale sub ohm tanks, and standard tanks. Sub ohm vaping, which is ideal for those who want better performance, thicker vapor, and flavor from their standard devices, is currently on the rise so be sure to check out our wholesale sub ohm tank products from brands like Horizon and Tobeco. • Coils: We carry replacement coils for many popular tanks on the market as well as pre-built coils for builders who want an easier way to rebuild their atomizers. • E-liquids: Our e-liquids include products from many brands and flavors, including nic salts and sizes like 60ML and 100ML e-liquids. • Accessories: Our accessory products include everything you need for your vape and more: batteries, chargers, drip tips, replacement glass, rebuildable accessories, flashlights, and even fidget toys and clothing items. You can place orders through our website www.kingdomvapor.com or through our customer service phone number at 814-297-8240. Payment options include Mastercard, Visa, American Express, and Discover. All orders are typically shipped within 24 hours of the order being placed and orders placed before 2 p.m. EST will be shipped the same day. Orders over $1,000 will automatically receive free shipping. Contact us today for more information about our products or to place an order. We look forward to hearing from you! Looking for a wholesale electronic cigarette isn’t an easy feat. In a highly competitive industry, it isn’t easy to find the right products for fair prices. Here at Kingdom Vapor, we take pride in providing a wide selection of the greatest brands, so you don’t have to take the trouble to scour the internet for a reasonable deal. With us, you won’t just be purchasing your e-cigarettes wholesale; you’ll be purchasing the exact ones that you want. It’s important to have choices, and that goes for your customers just as much as you. If you want to provide a premium shopping experience for your customers, why not experience one yourself in the process? Take a look at our selection, and you’ll find some of the best supplies around. We’re the perfect spot for your wholesale electronic cigarette, and we’d like to show you a couple options to prove it. One of our favorite options on our site is the SMOK Rolo Badge. 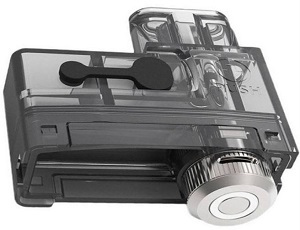 This is an incredibly sleek vaporizer pen that boasts style as well as functionality. It’s a compact vape pen that boasts quite a bit of power. Your customers will love this one, as they’ll benefit from an easily refillable pod system that can hold up to 2ml of E-Liquid. What’s even cooler is the draw activation; you don’t even need to push a button to draw vapor out of this one! The moment you start to draw, it turns on and allows for your drag. This is the kind of stylish product that vape fanatics love, and it comes with two pods! There isn’t a product on the market that’s more unique than this one, and we’re excited to watch it continue to make waves! That’s the kind of selection that you can expect from Kingdom Vapor! Another fantastic option is the JILI Box PCC Charging Pack. 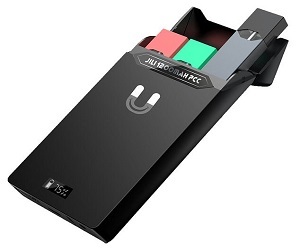 This is quite the scientific marvel, as you can now rely on a 1,200mah power bank charger for either your JILI or JUUL and hold a device with two replacement pods as you travel! With a single charge, you can recharge the JUUL battery two to three times; can you say ‘efficient’? Not only this, but it charges with a simple micro USB. With two pods and your device on you always, it’s a pretty safe bet to say that this is an incredibly helpful product. With the help of Kingdom Vapor, you’ll never be stuck without charge again! That’s what makes us number one. The fact of the matter is, no matter what kind of wholesale electronic cigarette you choose, you’ll find the right one at Kingdom Vapor. We’ve got the supplies necessary to stock your store with the best brands for cheap. If you’re just starting out with your business or just looking for a new supplier, you’ve come to the right place. We care about customer service just as much as our products, so if you have any questions, do not hesitate to ask. Kingdom Vapor is here for you!